This fun and fresh design is a lovely choice for your special day. 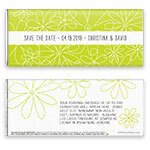 Design: Hand-drawn daisies and white ribbon. Personalization: Front event, names and date, back message.